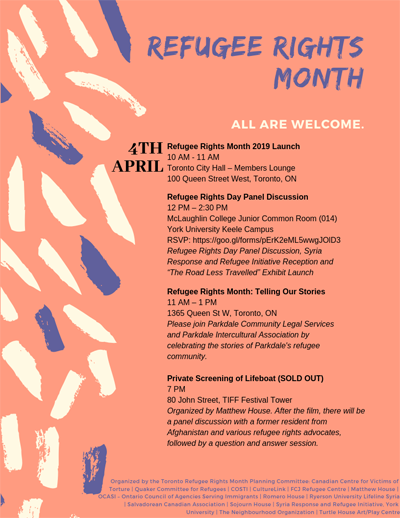 Celebrate Refugee Rights in Canada on April 4! Refugee Rights Month is commemorated on April 4 every year in Canada to bring attention to the advances made in the protection of refugee rights in Canada as a result of the Supreme Court decision (the ‘Singh’ decision) in 1985. Join us this year to commemorate the 33rd anniversary of the 'Singh Decision'. Statement from Toronto Refugee Rights Month Planning Committee. Scroll down to see a list of activities in Toronto that you can join. Most activities are free of charge. Everyone is welcome. McLaughlin College, the Centre for Refugee Studies (CRS) and its Syria Response and Refugee Initiative, with co-sponsors the Department of Sociology and Centre for Public Policy (Osgoode Hall Law School), York University, are proud to present this event. This event and day of reflection marks Refugee Rights Day in Canada (April 4th) and a reception to recognize the efforts of York-based refugee sponsors and mark the formal conclusion of York’s Syria Response and Refugee Initiative (SRRI), a Syrian refugee resettlement and education project (2015-2019) hosted by its Centre for Refugee Studies. This event will also mark the formal launch of a mixed media exhibition “The Road Less Travelled,” (at 2pm) by Professor Nergis Canefe of York University’s Centre for Refugee Studies and Department of Politics, which will be displayed in the McLaughlin College Art Gallery (001 McLaughlin College) throughout the month of April. On April 4, 1985 the Supreme Court of Canada declared that the Charter of Rights and Freedoms protected EVERYONE - including refugees. Please join Parkdale Community Legal Services and Parkdale Intercultural Association on April 4, from 11 AM to 1 PM by celebrating the stories of Parkdale's refugee community. Turtle House Ceramics is a special clay-making project by Turtle House Art/Play Centre for Newcomer artists and non-artists primarily from refugee backgrounds. In celebration of Refugee Rights Month this April, an exhibition will be on display in the lobby (April 3 to 7) featuring new works by participants of the project. Please join us for an evening of art brought to us by 6 local artists who will share their stories of courage and guest speakers, Loly Rico (FCJ Refugee Centre) and Jehad Aliweiwi (Laidlaw Foundation). All are welcome. You are invited to an evening of visual art, music and stories in celebration of Refugee Rights Month. Through this event we are going to honour the contributions made by refugees, inviting them to showcase their works and artistic talents. York Woods Library Theater, 1785 Finch Ave W, North York. You are invited to a community education event celebrating the experience and contributions of refugees in recognition of Refugee Awareness Month. The event will include theatrical presentations, music and dance by refugees to Canada, digital stories, and refreshments. The Quaker Committee for Refugees celebrates Refugee Rights Month with the play, Home Away from Home. We invite the community to attend our interactive theatre performance, opening a dialogue on the complexities and challenges faced by newcomers to Canada. Admission free. The entertainment begins at 3:00 pm and the play starts at 4:00. For more information contact Eusebio Garcia, tel. 416-964-9669. The annual book sale will be held at the same location on Saturday 27 April 2019, 10 AM – 4 PM; and Sunday 28 April 2019, 10 AM – 1 PM. All proceeds go to Toronto Friends Sponsoring Refugees. For details, contact John Gell, tel. 416-769 -2298.